HGM93XX MPU(CAN) series genset controllers are used for genset automation and monitor control system of gen-set to achieve automatic start/stop, data measure, alarm protection and “three remote” (remote control, remote measuring and remote communication). 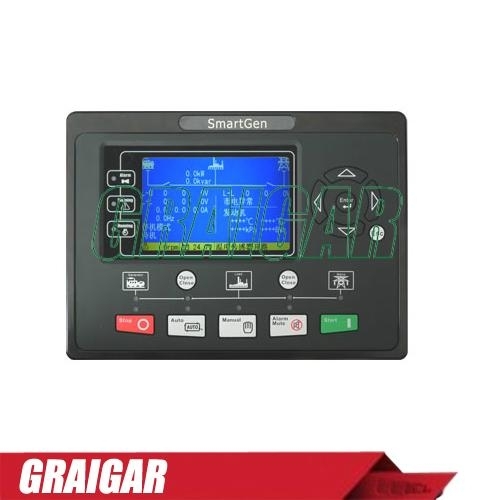 The controller adopts large liquid crystal display (LCD) and selectable Chinese, English or other languages interface with easy and reliable operation. HGM93XX MPU(CAN) gen-set automatic controllers adopt 32 bits micro-processor technology with precision parameters measuring, fixed value adjustment, time setting and threshold adjusting and etc. The majority of parameters can be configured from front panel, and all parameters can be set using PC (via USB port) and can be adjusted and monitored with the help of RS485 port. It can be widely used in all types of automatic gen-set control system with compact structure, advanced circuits, simple connections and high reliability. HGM9310MPU(CAN）, used for single automation systems, auto start/stop of the unit are performed with the help of remote singal. HGM9320MPU(CAN), has all functions of HGM9310MPU(CAN) as well as automatic mains failure function(AMF), particularly well suited for single automation system that inclide mains and generator. ♦All output ports are relay-out. ♦All parameters used digital adjustment, instead of conventional analog modulation with normal potentiometer, more reliability and stability. ♦Waterproof security level IP55 due to rubber seal installed between the controller enclosure and panel fascia. ♦Metal fixing clips enable perfect in high temperature environment. ♦Modular design, self-extinguishing ABS plastic enclosure, pluggable connection terminals and embedded installation way; compact structure with easy mounting. DC8.0V to DC35.0V, Continuous Power Supply.